A few memories of a child in wartime by Eva Sabin, nee Kilby. I grew up in Kilby’s shop in High Street. We lived above the shop with my grandparents who owned it. My first recollection of the Second World War is a Sunday morning in the shop with my mother listening to the speech declaring we were at war with Germany. I was six years old and I remember mother crying and hugging me. I was sad but did not understand what it was all about. The next thing was ration books and shortages and men going off to be soldiers, gas masks which you had to take everywhere with you and the horrible smell of rubber when you put it on. Probably the bombs that fell in Leamington and Coventry actually brought the war to us. 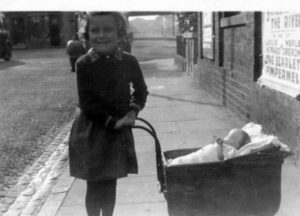 The night that bombs dropped near the Parish church I was having my bath in the tin tub in front of the kitchen range, the scream of the bomb falling was enough for me to leap out of the bath, soaking wet and onto my mothers lap as the bomb landed. Another time I was in bed with earache, which I had quite often and was probably glue ear, when I felt mother trying to lift me Eva & dolls pram out of bed as the bomb dropped at the other side of the railway. The force threw her on top of me and I was gathered up and rushed down stairs to my grandparents in the sitting room. The night Coventry was bombed I sat on the stairs with mum and dad looking out of a north facing landing window. Dad said: “My God, Coventry is having it tonight“. The sky was a red glow for as far as I could see and the next day, people from Coventry flocked to Leamington by the busload for respite and refuge. I think that apart from the bombing of Coventry, the thing that had most effect on Leamington and its people was the stick of bombs that dropped on Regent Street, at Lipton’s on the Parade, displacing Queen Victoria’s statue opposite and killing two soldiers sheltering in the doorway, at the corner of Bedford Street, on the Pump Room Gardens and in York Road. We had a family evacuated from London. Their name was Coates and the daughter shared my bed. They brought a maid with them but they moved on to the country quite soon. Also at this time Leamington had a lot of evacuee children from London and we had to share our time at school with them. We locals had mornings at school and the evacuees went in the afternoons. The younger teachers had left for the war and a lot of elderly teachers were brought out of retirement to fill the gap. I still think we had a good education and could put a lot of today’s children to shame. Dad was in the Home Guard and a gun used to hang on the kitchen wall. He taught me how to fire it in case it was needed. 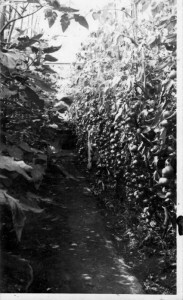 Dad grew a lot of vegetables on the St Mary’s allotments. 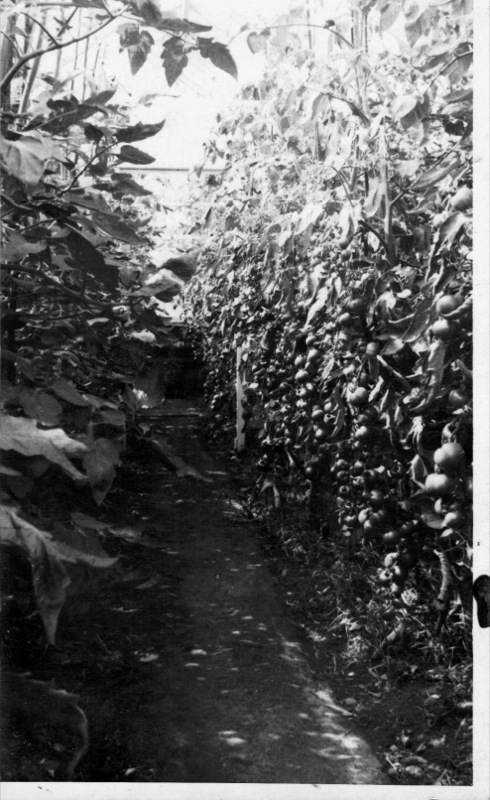 I have a photo (right) of his greenhouse full of tomatoes from floor to ceiling, – it got him a write-up in the Courier. We also kept a pig which was slaughtered in October, some was salted down for bacon and ham and everyone joined in to cook the other bits and pieces. Nothing was wasted.